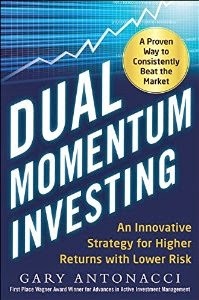 Today is the official release day of Dual Momentum Investing: An Innovative Strategy for Higher Returns with Lower Risk. I wrote the book to help as many people as possible earn attractive returns and minimize bear market drawdowns. Antonacci's extensive research and his clear-headed thinking have led to a book that every investor should read. The academically oriented reader will be grateful for his occasional excursions into the weeds, his carefully laid-out data, and his lengthy bibliography. The practically oriented investor will find a road map for moving ahead and staying out of really big trouble ...This one's a keeper! 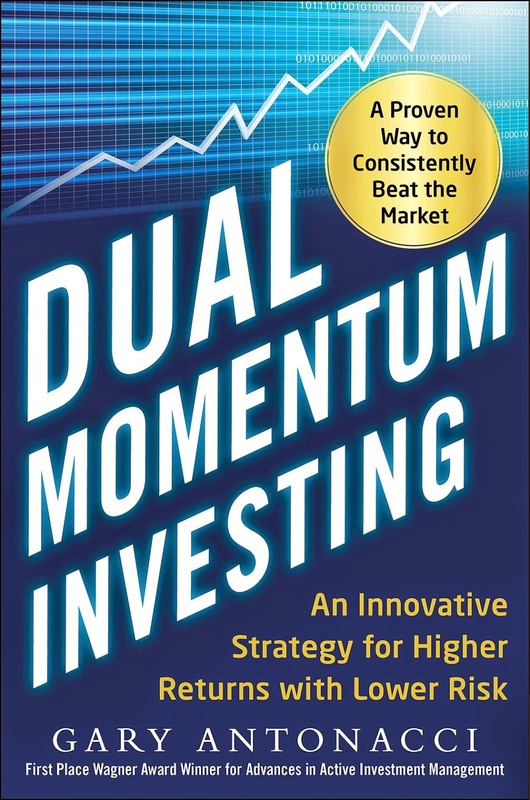 Dual Momentum Investing: An Innovative Strategy for Higher Returns with Lower Risk is a must-read for individual investors and financial professionals…Antonacci has done the heavy lifting for his readers by thoroughly researching the history and data behind momentum investing. The result is a well-researched and overwhelming argument for momentum investing. Readers are rewarded with a simple, robust strategy that anyone can implement. Antonacci demonstrates returns to Dual Momentum and the empirical evidence through extensive backtesting across multiple decades; the analysis includes various risk metrics (returns, standard deviations, Sharpe, drawdowns, etc. ), and robustness studies, the interpretation of which he explains in detail, so that the reader can have an informed view of the data. The evidence culminates in a simple but powerful applied momentum model: Antonacci’s Global Equities Momentum (GEM) strategy, which uses these dual momentum ideas to tactically allocate across and among domestic and international equity and bonds. And the results are nothing short of spectacular: superior returns, with low volatility. The Kindle version of the book was released on October 9, so there are also a dozen reader reviews on Amazon, as well as endorsements from prominent industry professionals. Click here to read these, find out more about the book, or to order it now. Believe it or not, I was once a value investor. From an early age I was impressed with the long-run success of such value luminaries as John Neff, Bill Ruane, Walter Schloss, and Max Heine. Being of a contrary temperament, I also liked the idea of buying stocks that were out-of-favor and ignored by the multitudes. 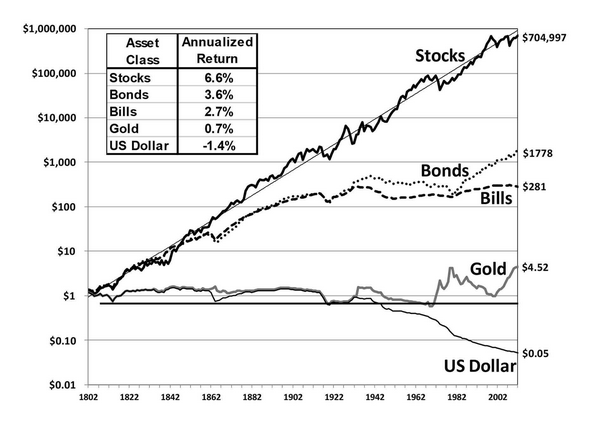 Supporting this approach, DeBondt and Thaler (1985) presented evidence that stocks overreact to bad news, and that poor performers over the past 3 to 5 years tend to outperform when moving forward. Value investing seemed to have representative bias going for it, whereby investors overreact to poor performance and project it far into the future while failing to account for long-run mean reversion. In 1992, Fama and French presented their groundbreaking paper indicating that value and small cap stocks offered up a risk premium to investors. I, along with the rest of the civilized world, readily accepted this idea. What got me away from value wasn't anything about value itself, but rather was my discovery, after reading a plethora of research papers on momentum, of just how strong momentum is compared with anything else. Looking at relative strength momentum applied to individual stocks showed a higher premium. What also got me excited about momentum though was my own research showing that momentum can be applied not just across different investment opportunities, but to single investments themselves in the form of trend-following absolute momentum. Absolute momentum not only enhances returns like relative momentum, but it can also greatly reduce drawdown. As far as I could tell, no other anomaly could do this. The value premium… is largely concentrated only among small stocks and is insignificant among the largest two quintiles of stocks (largest 40% of NYSE stocks). Our smallest size groupings of stocks contain mostly micro-cap stocks that may be difficult to trade and implement in a real-world portfolio. Earlier research by Loghran and Hough (2006) also found the value premium to be illusionary. Research by Das and Rao (2012) showed that large cap value only works in January. On another front, Chen et al. (2011) proposed an asset pricing model in which investment and profitability are the main explanatory variables, rather than value and size. Fama and French (2014) then expanded their established three-factor model to include investment (expected future changes in book equity) and profitability (expected future net income relative to book assets). When doing so, they concluded that value was redundant. So did all this put a nail in the coffin of value investing? Not necessarily. Israel and Moskowitz had looked at value using the popular book-to-market ratio. They found similar results using other value measures, such as dividend yield and long-term reversals that had data going back to at least the 1930s. However, these were only singular measures of value. Dhatt et al. (2001) found that composite measures of value were superior to any individual metric. Moreover, in their book Quantitative Value: A Practitioner's Guide to Automating Intelligent Investment and Eliminating Behavioral Errors, Gray and Carlisle identified a valuation metric based on enterprise multiple, defined as total enterprise value (TEV), divided by earnings before interest, taxes, depreciation, and amortization (EBITDA). Here is a table of valuation metric comparisons by Gray using equal weight portfolios sorted into quintiles. 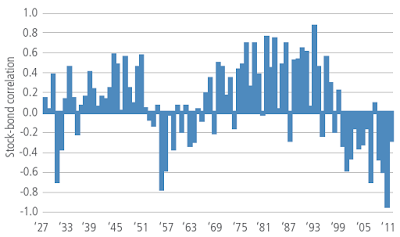 Data is from 1971 through 2010 and excludes micro caps. But Loughran & Wellman (2010) found only a difference of only .02% per month between book-to-market (HML) and the enterprise multiple (EM). Some researchers have found that adding a financial strength or quality metric may improve the risk-adjusted results of value portfolios. Paying attention to these extra factors can help overcome the problem of the "value trap," which happens when stocks remain depressed (and may go bankrupt) because their poor fundamentals warrant it. We should keep in mind though that there is always the potential of overfitting and selection bias when combining factors. Using global data from 1988 through 2012 and U.S. data from 1963 through 2012, Kozlov and Petajisto (2013) found that going long stocks with high quality earnings (based on high return on equity, high cash flow, and low leverage) and short stocks with low quality earnings gave higher Sharpe ratios than a similar value only strategy. They also found earnings quality to be negatively correlated with value. The best Sharpe ratio came from combining high quality with value, since there were significant diversification benefits. Using a different approach, Piotroski and So (2012) came up with a multi-factor scoring method (F-Score) to measure a firm's financial strength. This method was positively correlated with profitability and earnings growth. Piotroski and So found that strategies formed jointly on F-Score and value outperformed traditional value only strategies. Novy-Marx (2012) found he could simplify the quality factor to just gross profitability, defined as revenues minus cost of goods sold, scaled by assets. Novy-Marx (2013) found on U.S. stock data from 1963 through 2012 that profitable firms generated significantly higher returns (0.31% per month) than unprofitable firms, despite having higher price-to-book ratios. Novy-Marx (2012) also found that joint strategies combining value with Piotroski/So's F-Score, Greenblatt's magic formula, or gross profitability outperformed traditional value, with profitability plus value being the strongest combination. 1) It should combine value with other criteria, such as quality or profitability screens. 2) It should determine value based on several value metrics and/or a value metric that incorporates the enterprise multiple. 3) It should not dilute returns by having too broad a portfolio. In Chapter 6 of my new book, Dual Momentum Investing: An Innovative Strategy for Higher Returns with Lower Risk, I show that many so-called smart beta funds are like closet index funds with modest stylistic tilts. Many value funds are the same. Even though the value effect is more pronounced in the top 10-20% of value rated stocks, most funds dilute this effect by using the top third or top half of value stocks instead of the more profitable top 10-20%. 6) For taxable accounts, ETFs are preferred over mutual funds and hedge funds. Capital gains occur only when you sell your ETF holdings, whereas mutual funds have yearly taxable distributions of capital gains. If value and quality actually do well together, it is natural to think of actively managed mutual funds when considering investment candidates based on such factors. This is because most active managers use fundamental analysis (which takes into account profitability in the form of financial strength), managerial acumen, competitiveness, quality of earnings, and other judgmental factors besides valuation. But most active managers lack transparency. This gives them the appearance of possessing proprietary knowledge that may be worth paying a premium to access, but it also means it is often difficult to tell if they meet the first two criteria listed above. Active mangers also charge high fees. The Morningstar average large cap value fund annual expense ratio is 1.16%. Mutual funds also have a drag on their performance because of their reserves that are held for redemption. Also, as mentioned above, these funds are generally not tax efficient. But there is one mutual fund that may be worth looking at. It is the AQR Core Equity Fund (QCELX). This fund meets our first two requirements above, since it uses three indicators of profitability along with five indicators of value. For good measure, it adds three momentum indicators. QCELX has an annual expense ratio of 58 basis points. It is not tax efficient, but AQR has plans for a more tax efficient version of the fund. QCELX currently holds 413 stocks, which is more than 40% of the stocks in its 1000 mid/large cap stock selection universe. Investors are paying a high fee for the index part of this fund. In the ETF realm, until this past week there was only one fund that qualified using the above criteria. It was the PowerShares Dynamic Large Cap Value ETF (PWV) based on the Intellidex methodology. PWV uses a ranking selection method with four indicators of value and four indicators of growth. They subtract their value from growth rankings then select the largest negative scores. This process gives PWV some profitability exposure, according to the research of Bridgeway Capital Management. Bridgeway found that a multi-indicator value approach (adding price/cash flow, price/earnings, and price/sales) provides greater exposure to gross profitability than a portfolio based only on price/book. To help further with profitability exposure, after doing their basic screens PWV adds weightings for price momentum, earnings momentum, quality, and management action. PWV selects the top 20% of the largest 250 stocks from a potential universe of 2000. This gives them a focused portfolio of 50 stocks that PWV rebalances quarterly. (I would prefer that they derived their portfolio of 50 stocks by selecting the top 10% of the largest 500 stocks instead of the top 20% of the 250 largest stocks.) They allocate half their capital to the top 15 ranked stocks, and the other half of their capital is divided among the remaining 35 stocks. Their annual expense ratio is 58 basis points. 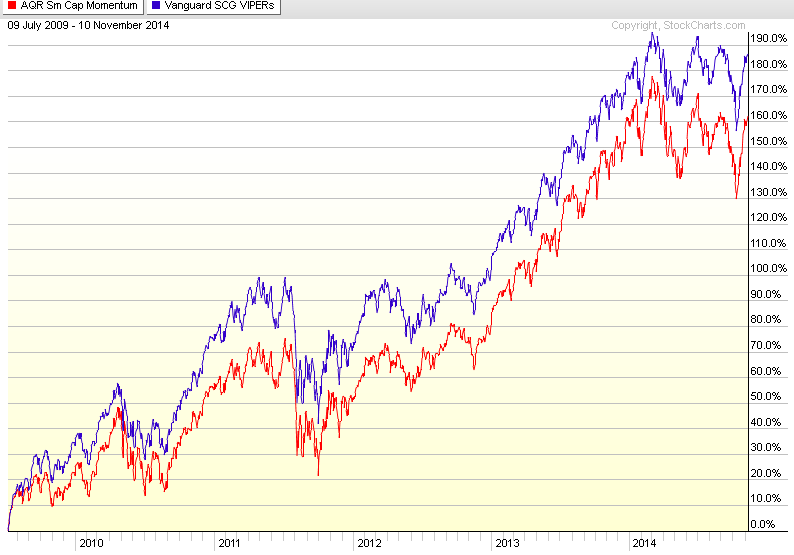 PWV's performance since inception has been attractive compared to the iShares S&P 500 Value ETF. Past performance is no assurance of future success. This week another ETF got on to the short list of qualified candidates. The new kid on the block is the Value Shares U.S. Quantitative Value ETF (QVAL) offered by Alpha Architect. QVAL incorporates quality in several ways. First, it has forensic accounting screens to avoid firms at risk for financial distress or manipulation. Then it filters for financial strength using a modified Piotroski/So F-Score. Finally, QVAL checks for sound business fundamentals through what it calls an "economic moat." This is a screen for firms having sustainable competitive advantages, a la Warren Buffett. QVAL's management uses the enterprise multiple to determine value. They select the top 10% of their large cap universe based on value, then drop the bottom half of these based on quality. The remaining 50 stock portfolio is equal weighted and rebalanced quarterly. QVAL's annual expense ratio of 79 basis points is high compared to PVW and QCELX, but QVAL is the most focused fund among the three, selecting only the top 5% of quality/value stocks in their mid/large cap universe, compared to PVW's 20% and QCELX's 40%. In looking at any of these enhanced value programs, you may want to consider an alternative such as the iShares MSCI USA Value Factor ETF (VLUE) that selects 20% of its benchmark universe and has an annual expense ratio of only 15 basis points. The VLUE simple strategy may also be less overfit to past data. 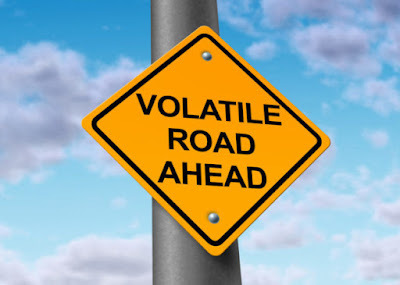 Value investing in general poses risks that all investors should be aware of. One of these is high tracking error relative to the market. Value can go through sustained periods of under performance, such as during the 1990s. From 1994 through 1999, value underperformed growth by over 10% per year! 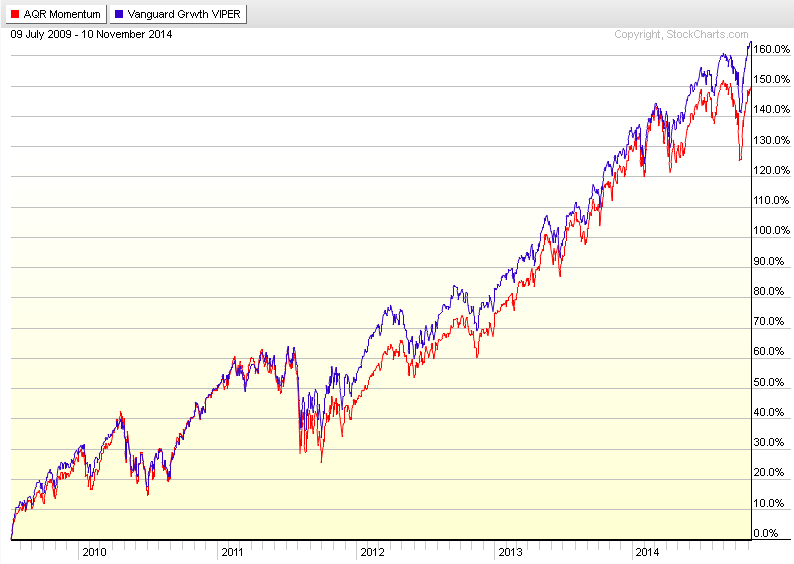 With focused portfolios of just 50 stocks, PVW and QVAL can have much higher tracking error than other value funds. Value investors need to have a long-term investment horizon and a high tolerance for prolonged periods of underperformance. There is also the potential problem of overfitting the data which comes from data mining. The use of filters and multiple selection criteria by all the above mentioned funds increases their chance of disappointing ex-post returns going forward. 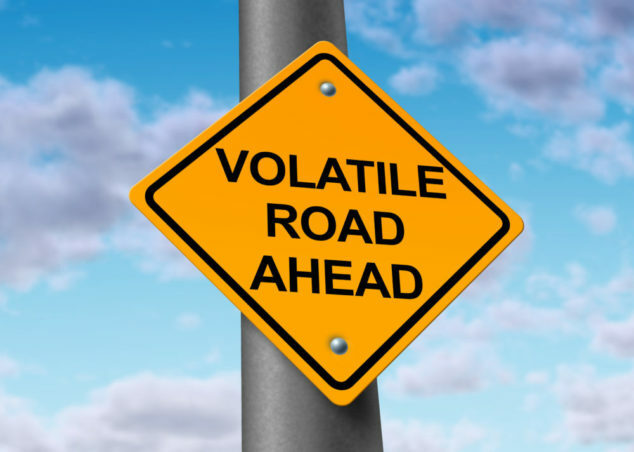 Value investing with focused portfolios, such as those of PWV and QVAL, is also subject to high volatility and high drawdowns. Investors should be prepared for these as well. Unfortunately, investors often lose sight of this. They panic and act counter to their best interests when confronted with severe drawdowns once bear markets arrive. In a survey of its members since 1988, AAII found that the highest weight to cash and the lowest weight to equities was in March 2009, right at the bottom of the worst bear market since the 1930s. There is a way, though, that one may mitigate some of this harmful behavior. It is by using absolute momentum. (You didn't think I would write a long post like this without mentioning momentum, did you?) My research paper on absolute momentum and my new book show how to use trend following absolute momentum to reduce the expected drawdown of most any investment opportunity. The chart below of absolute momentum applied to the S&P 500 illustrates this.One could also incorporate value into a dual momentum-based model, such as the one featured in my new book. Unfortunately, value does not respond as well as relative momentum portfolios or the market itself to trend following filters. But by adding an absolute momentum filter to value-based holdings we should get some drawdown protection. AQR has this same kind of broad participation in their momentum fund, where they hold 47% of the 1000 stocks in their selectable universe. Why do they not target factor profits more? Perhaps they expect liquidity issues. This may also explain why their portfolios are, for the most part, capitalization weighted instead of value or equal weighted. We found in examining the Ken French data of value, operating profits, and the joint sort of value and operating profits from 1964 through 2014, that the combination of value and operating profitability had a higher volatility and worse drawdown than value or operating profits themselves. This material is for informational purposes only. It is not a recommendation to buy or an endorsement of any securities. Investments are subject to risk including loss of principal. You should do your own research before investing. Please see our Disclaimer page for additional information. Most academic research on momentum deals with individual stocks. Most applications of momentum are also oriented toward individual stocks. The three largest momentum programs (AQR momentum mutual funds, PowerShares DWA Momentum ETFs, and iShares MSCI USA Momentum Factor ETF) all use individual stock momentum. The only public program using momentum applied to asset classes was the ALPS Goldman Sachs Momentum Builder, which recently went out of business due to lack of interest. 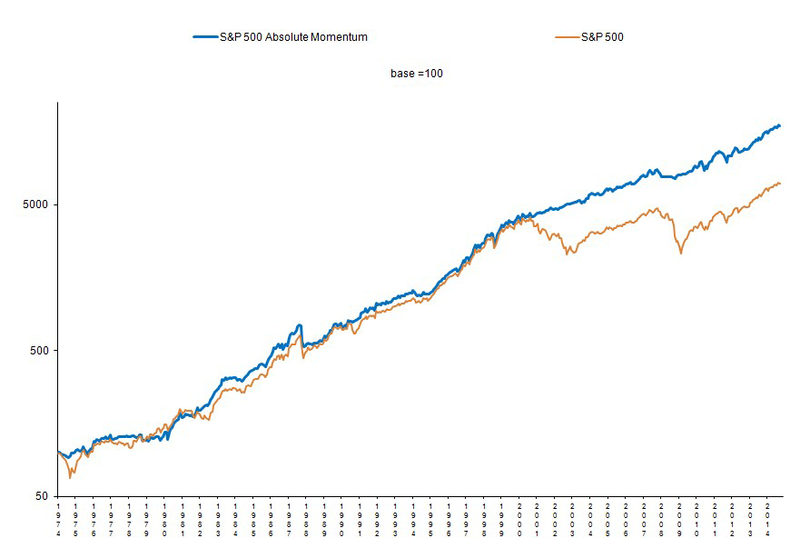 Yet momentum applied to individual stocks is not the ideal way to use momentum. High transaction costs can negate much of the benefit of momentum investing, and most stock momentum programs dilute the momentum effect by selecting hundreds of stocks instead of just the ones showing highest relative strength. Momentum applied to indexes or sectors, rather than individual stocks, can capture high momentum profits with much lower transaction costs. Here is a table from my new book Dual Momentum Investing: An Innovative Approach to Higher Returns with Lower Risk. This table shows the performance of the AQR Momentum Index composed of the top one-third of the 1000 highest capitalization U.S. stocks based on 12-month relative strength momentum with a one-month lag. AQR weights their index positions based on market capitalization and adjusts the positions quarterly. For comparison, we show the performance of the Russell 1000 index and from applying absolute momentum to the Russell 1000 by moving into aggregate bonds whenever 12-month absolute momentum is negative. These figures do not account for the 0.7% per year in transaction costs for the AQR Momentum Index, would have put it at a disadvantage to even the Russell 1000 index on a risk-adjusted basis. Table 9.3 shows the AQR Momentum Index, the Russell 1000 Value Index, and a 50/50 combination of value and momentum, which was advocated in the Asness et al. (2013) paper "Value and Momentum Everywhere." This combination is supposed to be desirable due to the negative correlation between value and momentum. But the Asness et al study used long/short momentum and long/short value. Hardly anyone actually invests that way. Long only momentum and value are highly correlated. .
We see that value combined with momentum (rebalanced monthly) does give a higher Sharpe ratio than either value or momentum alone. But there is little or no advantage with worst drawdown, and the results still pale in comparison to simple absolute momentum used with the Russell 1000 Index . 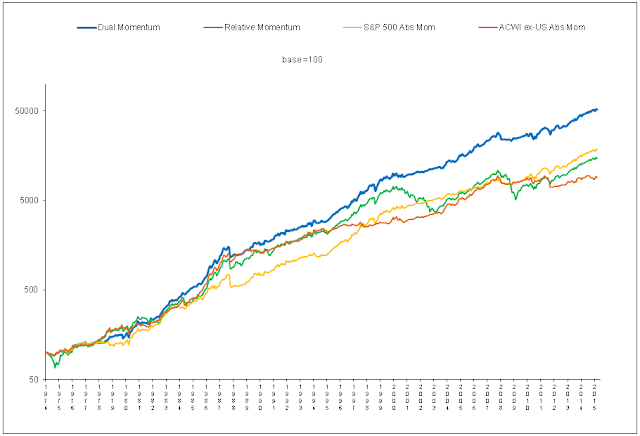 As a further check on the possible worthiness of combining value with momentum, I used the Global Equity Momentum (GEM) model described and tracked on the Performance page of our website. Full disclosure of GEM and instructions on how to use it are in my book. 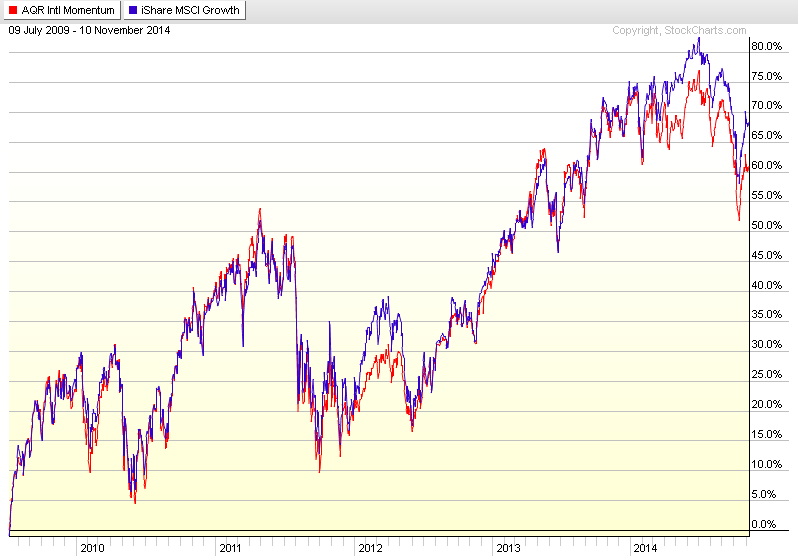 Using relative momentum, GEM switches between the S&P 500 and the MSCI EAFE when absolute stock momentum is positive. When absolute momentum turns negative, GEM moves into aggregate bonds. The table below shows GEM results from January 1974 through August 2014, as well as the results from adding the MSCI USA Value (large and mid-cap) index to GEM as a switching option and rebalanced monthly. We see that the inclusion of value into the momentum model adds nothing to the performance of GEM. The above are hypothetical results, are NOT an indicator of future results, and do NOT represent returns that any investor actually attained. Indexes are unmanaged, do not reflect management or trading fees. One cannot invest directly in an index. Please see our Disclaimer page for more information. Furthermore, as I pointed out in a blog post last year called "Momentum…the Practical Anomaly? ", Israel and Moskowitz of AQR show in their 2013 paper that value based on book-to-price only offers a long-term premium when applied to very small stocks, such as microcaps. These are unusable by larger investors. How one can mix individual stock momentum (which may offer nothing special after transaction costs) with value (which may also not be all that it was once thought to be) and create something extraordinary seems challenging. This is especially in true in light of an earlier paper by Daniel and Titman (1999) showing that value strategies are strongest among low momentum rather than high momentum stocks, and momentum strategies are strongest among growth rather than value stocks. Even so, researchers are nothing if not persistent and imaginative. When they found that Markowitz mean variance optimization (MVO) gave inconsistent results, researchers tried constraining the inputs, incorporating prior information to shrink the estimates, and even ignoring returns altogether to try to create portfolios that were more robust. In the end, they found that because of estimation error, equal weight portfolios were generally superior to MVO portfolios. The same overreach is true with the Capital Asset Pricing Model (CAPM). This started out as a single factor model that expanded to 3 and then 4 factors. Factor fishing has now come up with more than 80 possible data-mined factors, yet the factor pricing model may still not model the real world well. What is perhaps most interesting are the various findings the authors came up in the course of their research. As the saying goes, the devil is in the details. Here are some of those details. 1) Value, as measured by the price-to-book ratio, is beneficial only with small stocks and not with large stocks. This is the same conclusion reached by Israel and Moskowitz who used data back to 1926, and who also found it to be true of other valuation measures that had data back to at least the 1930's. 2) Despite high momentum portfolio Sharpe ratios before transaction costs, the high transaction costs associated with momentum portfolios negates much of the difference in Sharpe ratios between large momentum and large value portfolios. 3) Since small stocks have even higher transaction costs than large stocks, the authors incorporated higher transaction costs to conclude that none of the small momentum portfolio Sharpe ratios are higher than the Sharpe ratios of the small market portfolios. In other words, based on high transaction costs, individual stock momentum may not be good with either small or large stocks . So all we are left with that provides above market risk-adjusted returns are small value stocks that most investors (and particularly institutional ones) will find too expensive and difficult to trade. The authors then look for ways to salvage momentum by combining it with value in two different ways. The first is to rank firms by momentum and value, and then to compute an average rank. 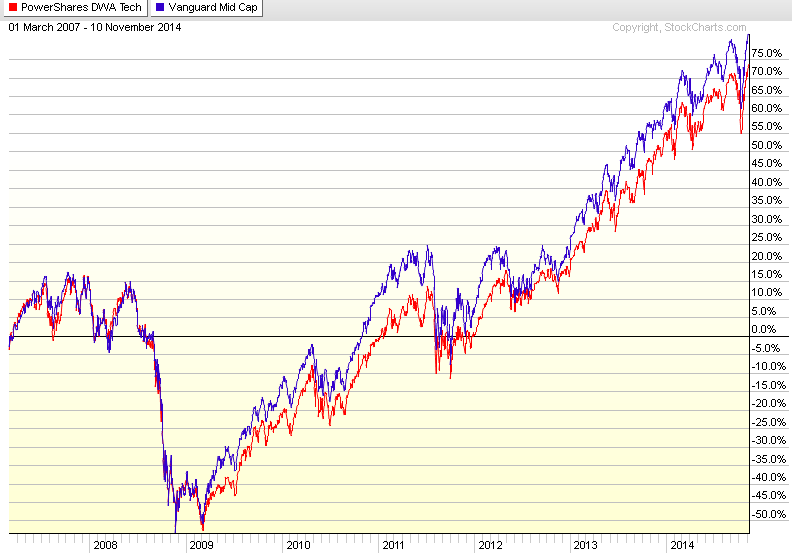 One signal can outweigh the other this way, and momentum still has high transaction costs with this approach. The authors' second approach is to use momentum as a filter for value-based portfolios. They buy stocks only when value and momentum are both favorable, and they sell stocks only when both factors are unfavorable. Momentum does not trigger any trades, but instead influences the portfolios by delaying or avoiding trades. Data mining for the highest ex-post Sharpe ratios with this second approach, the authors find much greater exposure to the value factor. The optimal small cap portfolios, for example, have value allocations of 79% or more. The role of momentum with this approach is very small. The authors' first approach gives higher Sharpe ratios when trading costs are low, and the second approach gives higher Sharpe ratios when trading costs are high. Of course, we do not know if these Sharpe ratios will continue out-of-sample into the future. We can avoid the issues of high trading costs and less certain Sharpe ratios if we instead use momentum with indexes rather than with individual stocks. In our 2012 post called "Value and Momentum…Not Here" we asked if there should be just value and momentum everywhere. I didn't think so then, and I see even less reason to believe so now. 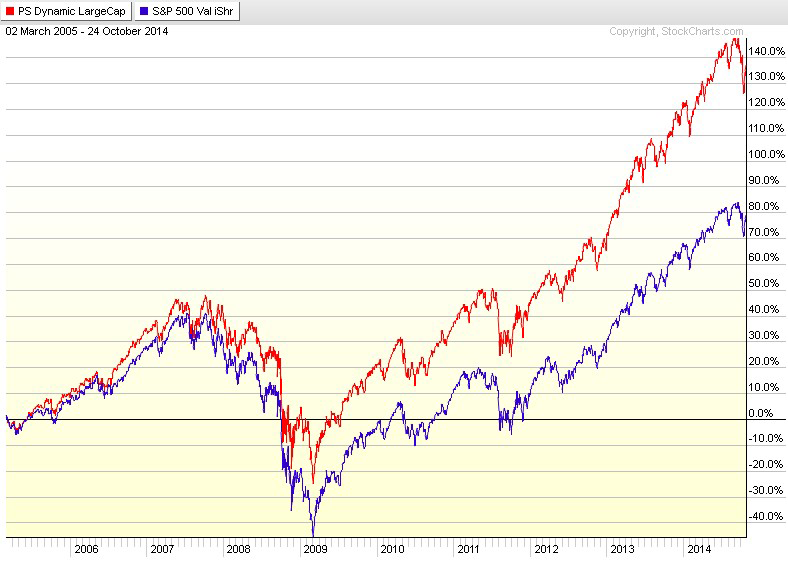 The AQR mutual fund using this index (AMOMX) has an annual expense ratio of 0.40%, while the Russell 1000 ETF (IWB) has an expense ratio of 0.15%. Results of momentum combined with value are better if a quality factor, such as profitability, is added, and if momentum, value, and profitability are applied to the same portfolio.See "Quality Investing" by Novy-Marx. A study last year by Frazzini, Israel, and Moskowitz looked at large institutional trades across 19 developed markets from 1998-2013. They found the trading costs of momentum to be low, despite a higher turnover than from other factors. A study by Lesmond, Schill, and Zhou (2004) called "The Illusionary Nature of Momentum Profits" showed that transaction costs reduced momentum strategy returns to close to zero. Fisher et al. uses transaction cost estimates that are between these two.